The directions were given at a video conference on Wednesday night with all DMs, amid reports that stray cattle were destroying crops. In parts of the state, farmers have reportedly herded stray cattle into places like government schools to save their crops. Adityanath directed strict action against owners of stray cattle and those locking up the animals in government buildings, an official said. He has asked that stray animals, including cattle, should be sent to shelters by January 10. The directive follows a recent state government decision to levy a 0.5 per cent cow welfare cess on some public sector undertakings to help construct and maintain more cow shelters. "Stray cattle sometimes become a reason for road accidents in urban areas. They also destroy crops in rural areas and can create law and order issues. All DMs should, therefore, take necessary action so that such issues do not happen," Adityanath said during the video conference. Wednesday night's meeting was also attended by Chief Secretary Anup Chandra Pandey and other top officials. The chief minister told the DMs to ensure that farmers and others do not face any problems due to stray cattle. The district magistrates should impose fines on those who come to the shelters to claim their cows after abandoning them. He said the authorities should ensure proper fencing at cow shelters and see that arrangements for feeding and veterinary care are in place. He said help from traders, businessmen and people's representatives should be sought in running 'kanji houses', the shelters were cows are currently kept. Adityanath has held a series of meetings after angry farmers locked stray cows in government buildings in some other parts of the state. Recently, people in at least two villages in Aligarh and Firozabad districts rounded up stray cattle and herded them into government schools, refusing to let classes run until the administration did something about the animals. The Adityanath government has cracked down on illegal slaughterhouses in the state and tasked the police to prevent cow slaughter. The CM said the funds allotted for cow welfare Rs 60 crore in 2017-18 and Rs 95 crore in 2018-19 should be used effectively. 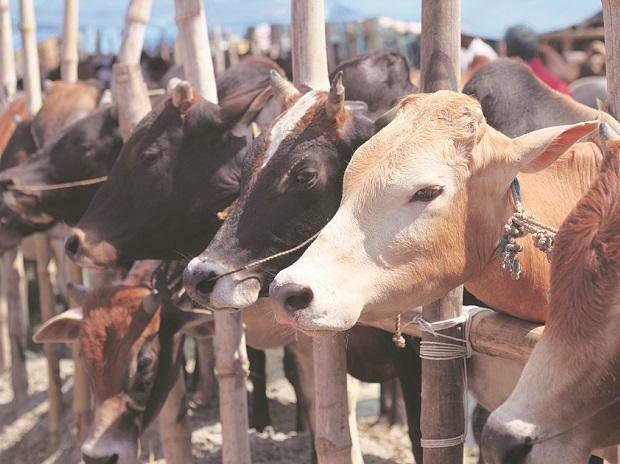 The state government had on Tuesday decided to introduce an additional levy of 0.5 per cent as cow welfare cess on eight profit-making public sector infrastructure companies to fund the construction and maintenance of cow shelters. The cess will also apply on travel on some expressways where motorists already pay a toll. The new cow shelters will be opened in all villages, panchayats, municipalities, nagar panchayats and municipal corporations, officials said. The shelters will have a capacity to hold at least 1,000 animals, they said.